Marian Goodman Gallery is very pleased to announce that we will open our 2002 season with the United States premiere of Dara Birnbaum's recent work Erwartung: Expectancy (1995/2001). The project will be on view from Tuesday, January 8th through Saturday, February 9th. 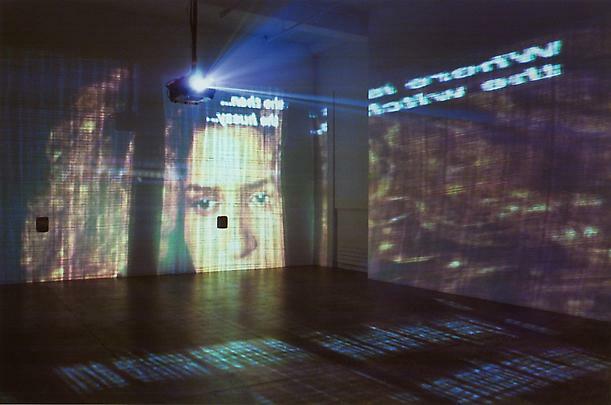 Dara Birnbaum's Erwartung/Expectancy was first commissioned in 1995 by the Kunsthalle Wien, Austria, on the occasion of a major retrospective exhibition of her work. 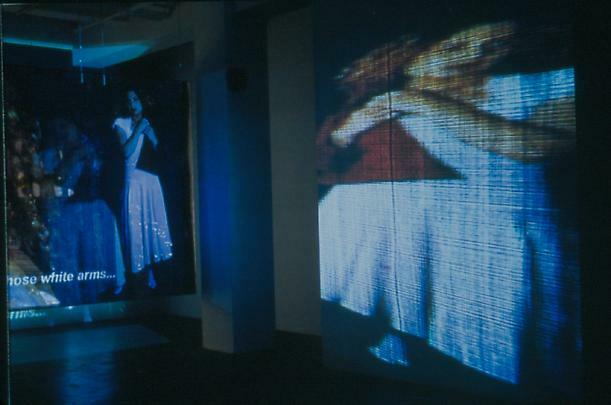 For that event, she created an outdoor installation consisting of fifteen serial Pani-slide tableaux projected onto a large scale computer-generated painting, a reproduction of one of Arnold Schoenberg's original six sketches for the stage set of his opera. In Erwartung/Expectancy, Birnbaum also emphasizes the libretto by Marie Pappenheim, who was then a 27-year-old medical student, poet, and a member of Schoenberg's circle in Vienna. Birnbaum was drawn to this 1909 composition, which was then—and is now—considered extreme in its musical composition and psychological exploration. As the artist says, "I found it particularly meaningful that the libretto was composed by a woman and that this one-act opera's only character is a woman. In her work, Schoenberg's original score is sampled and readdressed by utilizing contemporary electronic modes of composition, and then re-employed. Schoenberg's original internalization of the orchestra (a manifestation of the unnamed woman's inner world), now resides within a more contemporary electronic musical expression. In the new score, Birnbaum states, "rather than having the notes themselves be the main thrust of the emotion or expression, the quantizing and filtering of explicit sound samples becomes the expressive means of delivery…Throughout "Erwartung" there is a constant sense of anxiety, of loss and aloneness, which at the time was linked to Schoenberg's own sense of isolation (his existence in the new atonal universe, that was of his creating). However, I feel that our own sense of exclusion from a receding past, and its subsequent sense of developed isolation, still a century later expresses our own nature and fears." Dara Birnbaum's updated version of this early 20th century one-act opera contains newly created visuals and audio in order to embrace new possibilities of meaning for the main character, a woman whose search is not only for her lover but for a sense of fixity in a world of questions. Now revealed as a more contemplative figure, in more contemporary circumstances, we follow her drama through a series of intimate gestures (comprising both image and text), which reveal her constant state of "awaiting" as it is disrupted by temporal states of delusion and betrayal. Dara Birnbaum has achieved international recognition for her contemporary media exploration, and for her video installations which explore the psychological nature of the female subject, the architecture of power and display, and the nature of the viewer as consumer. The installation works from the past decade have used politically decisive moments as their touchstone, such as Hostage (1994), Transmission Tower: Sentinel (1992), which was commissioned by Documenta IX, and Tianamen Square: Break-In Transmission (1990). Single-channel video works from the previous decade include an exploration of the Faust legend, The Damnation of Faust, a trilogy made up of Evocation (1983), Will- 'O'-the-Wisp (1985), and Charming Landscape (1987). Other video works include Pop-Pop Video: General Hospital/Olympic Women Speed Skating (1980); Kiss the Girls: Make Them Cry (1979); and Technology/Transformation: Wonder Woman (1978), all of which explore the ideological and aesthetic character of popular culture and mass media imagery, specifically the representation of women in television. Each of these works is now seen as classic examples of appropriation and deconstruction of mass media, residing in such important permanent collections as the Museum of Modern Art, New York, Centre Pompidou, Paris, and the Stedelijk Museum, Amsterdam. Born in New York in 1946, Dara Birnbaum received a Bachelor of Architecture from Carnegie Mellon University, Pittsburgh in 1969; a B.F.A. in Painting from the San Francisco Art Institute in 1973; and A Certificate in Video and Electronic Editing at the Video Study Center at the New School for Social Research, New York, in 1976. She is currently completing an awarded commission for a permanent installation for the new government center of St. Pölten, the capital of lower Austria. She has been the recipient of numerous distinguished awards, including the American Film Institute's Maya Deren Award for Independent Film and Video Artists; the Special Jury Prize-Deutsche Videokunstpreis, Südwestfunk & Zentrum für Kunst und Medientechnologie; the TV Picture Prize, International Festival of Video and Electronic Arts in Locarno, Switzerland; among many others. Dara Birnbaum's work has been exhibited at the Museum of Modern Art, the Whitney Museum of American Art; the Centre Georges Pompidou, Paris; the Tate Gallery, London; Moderna Museet, Stockholm; the Stedeljik Museum, Amsterdam; and the Kunsthalle, Vienna. In 2002, her work will be included in Videoshow, at the Centraal Museum, Utrecht, Holland; as well as at the Institute of Contemporary Art, Philadelphia; and at the Espai d'Art Contemporani de Castello, Spain.